The official reports on the abuse that was happening in Ireland’s industrial schools and orphanages is old news by now, but I was just re-watching the “States of Fear” program that brought it all to light. Scary to think that I spend the ’70s and ’80s walking up and down outside St.Josephs and never even wondered what was going on inside. There was even a boy in my class who lived there. And still, today, we can see that there’s more horror still hidden. One of the Irish institutions that deserves as much praise as it can get is the GAA. A nationwide structure that gets everyone from kids to old folks involved. Across the country. Across the social spectrum. 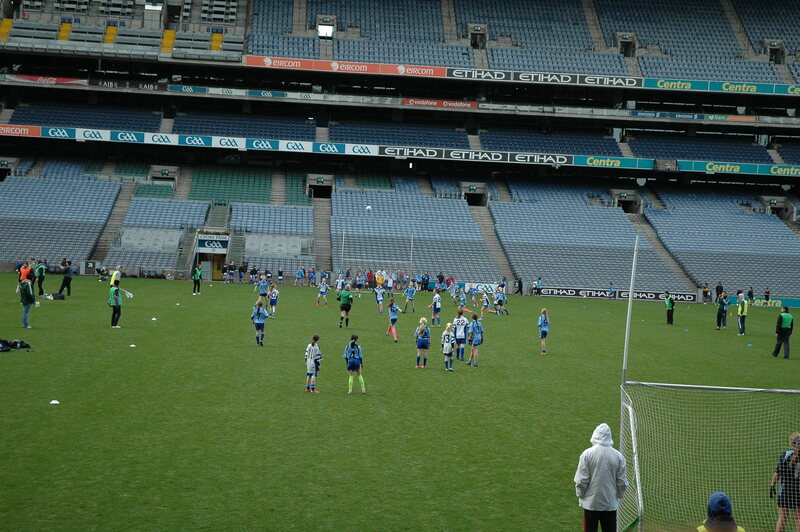 No matter whether it’s the All-Ireland final or – like today – an under 11 schools match, there’s slick organization, great facilities, and a competitive but friendly vibe unlike most other sports. Something for Ireland to be proud of. Abuse is abuse. Ability to escape is what’s important. A few weeks ago Fintan O’Toole of the Irish Times wrote an article about old people being neglected and abused in a for-profit nursing home. I wrote about it at the time. Basically he asserted that privately owned for-profit homes were evil but that we were all under the spell of profit just as we’d been under the spell of the Catholic Church in the past. It’s a nice narrative, but it’s hard to agree, particularly when we see what was going on in the UK with Jimmy Saville and a range of state run institutions. Here in Ireland we often talk about open data and the way that the government doesn’t often provide it. Now this example isn’t exactly the kind of open data that we generally talk about, but it is cool. You can see, in real-time, all the planes flying over the Netherlands and the levels of noise on the ground. I love it! I’m not 100% sure where the data comes from, I just think it’s cool. This data indicates again that this current Irish government does not actually care AT ALL about getting the Irish economy into recovery. They may care about other things, like their pensions, securing sectoral votes in the next election, pleasing the PS unions, and so on, but Irish economic recovery is NOT a goal they’re actually pursuing. New phone number, two prime factors. I have a new phone number. It has two prime factors, which is nice and elegant. 29 × 28669351. I think this is actually cooler than if it was a prime number itself. Prefix that with a zero if you’re in Ireland or +353 if you’re not and you’ll get to me. There is an interesting article in Al Arabiya about an all-female party planning to run in the Palestinian elections. Lest there be any doubt, if this party was running in Ireland they would not get party funding and even if they did – their allowance would be cut by 50% because they don’t meet the requirements of Ireland’s genderquota laws. This is a rather telling illustration that these genderquota laws are NOT about increasing women’s ability to become candidates. They are about securing the EXISTING parties’ hold on party funding and excluding any real change. The genderquota law is as cynical a move as can be imagined. That sounds about right considering who’s supporting it. Here’s the link to the article on some splendidly brave women. Good luck to them.